Ships today if ordered in the next 6 hours and 9 minutes! Includes: VarioS-4 pump, controller, float switch, power supply, protective intake screen and connection fittings. Two different pause/feed modes that will shut off the pump for either 15 or 60 minute intervals. 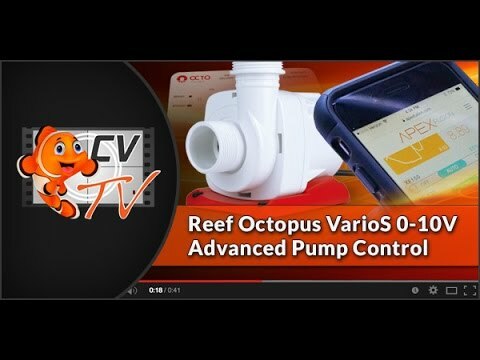 The Reef Octopus VarioS water pump features a detachable controller module, high quality ceramic shaft and propeller bearing to reduce wear and tear, and the latest variable speed flow technology for refined control, enhanced performance, energy-efficiency and safer operations. Unlike the vast majority of circulation pumps which uses alternating current (AC), the VarioS pump boasts several key advantages over traditional AC pumps, namely, higher energy efficiency, safer operations at a working voltage of 36V and most notably, the variable speed control to adjust the ideal mix of air and water flow into the skimmer. Direct current pumps have several key advantages over traditional AC pumps. Most notably, you can control the rotational speed of the motor, thus electronically control water flow rates. DC pumps are also more efficient than AC pumps and produce less heat per volume of flow. >>> Now the aquarist can have full control of the water flow through their sump, reactors, filters or closed loop systems!!! A float switch connection, which allows you to connect a float switch (included in the box) to the controller. This is an added security feature that allows you to shut off the skimmer pump when your waste collector is full or shut off your water pump when your sump water has reached a high or low level. In all, you don’t need another module or controller to add a float switch to your system. Two different pause/feed modes that will shut off the pump for either 15 or 60 minute intervals. These come handy when you are feeding the tank or conducting regular maintenance such as a water change. 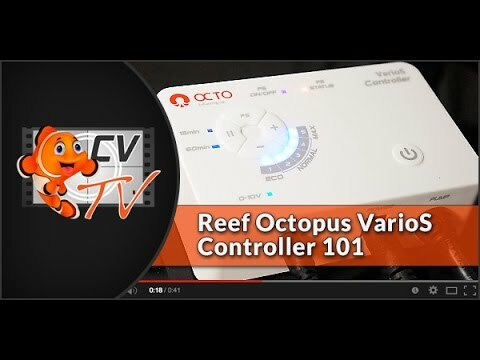 And the best feature of the VarioS controller is… a 0-10v input which will allow a 3rd party controller such as Neptune System’s APEX or Reef Angel to take over the pump and tell it what to do. In this mode, the new VarioS controller becomes an interface between the system controller and the pump allowing you to create intricate programs using your system controller native language. This is unprecedented controllability on a skimmer or water pump. In essence, you can use your system controller as your DC pump controller! Includes: VarioS-4 pump, controller, float switch, power supply, 1in output and input union for plumbing direct PVC, versatile stepped barb output fitting for flex tubing and protective intake screen. The VarioS pump features a true slow startup where the pump slowly ramps up from zero RPM to the full preset speed over a period of approximately 10 seconds. Note: THIS IS NOT A PRESSURE RATED PUMP. This pump is not ideal for second floor applications or to feed Beckett or downdraft skimmers where consistent pressure is necessary. Reef Octopus can not be responsible for consequential damages arising from installation or use of this product. Reef Octopus warrants the pump to be free from defects in material and workmanship under normal use and conditions for the warranty period from the date of purchase. CoralVue liability under this warranty shall be limited to repairing or replacing at CoralVue’s discretion, without charge. CoralVue will not be liable for any cost of removal, installation, transportation, or any other charges which may arise in a warranty claim. NOTE: This warranty is void if the product is damaged through abnormal operating conditions, accident, abuse, misuse, unauthorized alteration or repair. This warranty is valid only in North America and is non-transferable. Consumable spare parts are not applicable to the warranty.